Many consider that the conflict of religion and science is a temporary phase, and that in due course the two mighty rivers of human understanding will merge into an even mightier Amazon of comprehension. I take the opposite view, that reconciliation is impossible. I consider that Science is mightier than the Word, and that the river of religion will (or, at least, should) atrophy and die. In 'Religion - The Antithesis to Science', Chemistry & Industry (Feb 1997). Modern tree communities in Amazonia are structured to an important extent by a long history of plant domestication by Amazonian peoples. The big concern is that we’re starting to see a new normal, where fires, deforestation, drought and climate change are all interacting to make the Amazon more flammable. As quoted in Brad Plumer, 'Tropical Forests Suffered Near-Record Tree Losses in 2017', New York Times (27 Jun 2018). 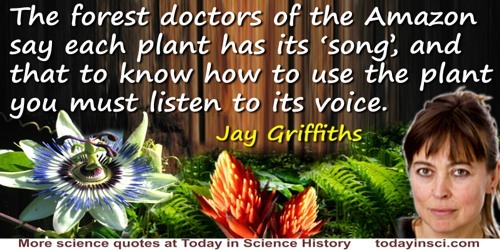 The forest doctors of the Amazon say each plant has its “song”, and that to know how to use the plant you must listen to its voice. In 'Fifty Years On, the Silence of Rachel Carson’s Spring Consumes Us', The Guardian (25 Sep 2012). The tragedy of deforestation in Amazonia as well as elsewhere in the tropics is that its costs, in... economic, social, cultural, and aesthetic terms, far outweigh its benefits. In many cases, destruction of the region’s rainforests is motivated by short-term gains rather than the long-term productive capacity of the land. And, as a result, deforestation usually leaves behind landscapes that are economically as well as ecologically impoverished. From Anthony Bennett Anderson (ed. ), Alternatives to Deforestation: Steps Toward Sustainable Use of the Amazon Rain Forest (1990), xi. As cited in Lykke E. Andersen (ed. ), The Dynamics of Deforestation and Economic Growth in the Brazilian Amazon (2002), 2. Through the magic of motion pictures, someone who’s never left Peoria knows the softness of a Paris spring, the color of a Nile sunset, the sorts of vegetation one will find along the upper Amazon and that Big Ben has not yet gone digital. Online transcript of interview, segment 'Amazon Deforestation' on NPR radio program, Living on Earth (25 Feb 2005).